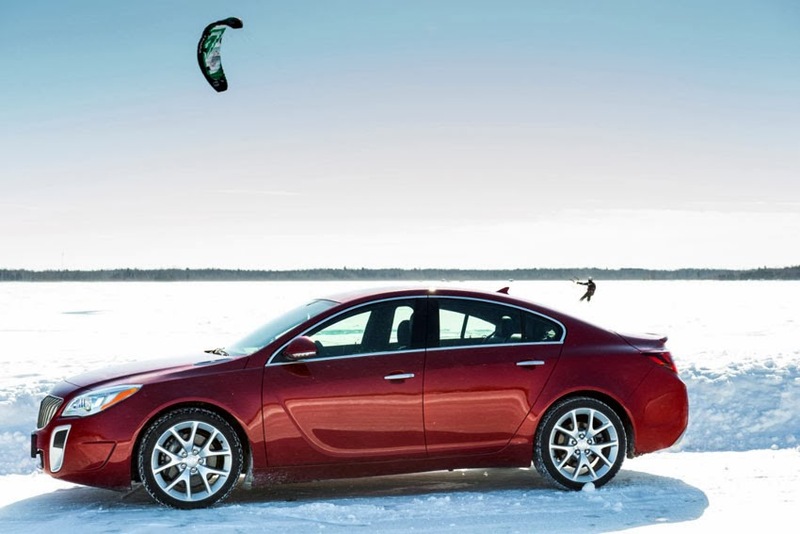 Along with the technology, safety, and styling enhancements offered on the redesigned Buick Regal and Regal GS, is the newly available advanced all-wheel-drive. with wintery weather, the Regal's on-demand automatic AWD system is designed to help provide better control in all weather and road conditions, including dry surfaces. Using a system that can distribute power both front to rear and side to side, the Regal is able to shift torque to the wheels based on vehicle data and driver input.When trekking through snow and icy conditions better control is achieved through improved traction and stability with drive to all four wheels. The same ideas are applied during spirited driving and even emergency maneuvers on dry or wet pavement. With the ability to transfer power to the rear, the Regal AWD is not depending on the front wheels to do it all. This, combined with HiPer Strut front suspension, results in enhanced control from less torque steer and understeer when the driver needs traction the most, such as exiting a corner. "With power going to all four wheels and the ability to transfer power to the wheel with the most grip, we've helped enable the driver to have maximum control on all surfaces," said James Walter, Regal AWD Engineer. "This system is constantly monitoring several inputs and anticipating action. It can be very beneficial in keeping the rear of the car balanced during an emergency maneuver." At launch in a straight line, the core of the AWD system splits the torque approximately 50/50 between the front and rear wheels. The system is constantly calculating and redistributing the torque.In the Regal GS, selecting the Sport or GS Interactive Drive Control modes heightens the AWD system sensitivity and shift up to 15 per cent more torque to the rear wheels for improve traction and stability during performance driving. An active Haldex module directs drive to the rear wheels. This system uses an electronic limited slip differential, or eLSD, which can rapidly shift torque between the two rear wheels to make the most of vehicle stability and cornering capability. A more neutral balance, less torque steer and understeer for maximum grip results in optimal acceleration, cornering and handling during performance driving in the Regal GS AWD. AWD is available on all 2014 Regal models equipped with the new 2.0L Turbo engine that produces a refined 259 hp and 295 lb-ft of torque. The Regal is the fourth Buick in the current lineup to offer AWD, alongside Enclave, Encore, and LaCrosse.